A long long time ago, I was known as The Vegas Vegan.The first post I ever wrote was about a terrible little Italian chain called “Buca di Beppo” and what was one of the most boring dining experiences of my adult life. Notice the lack of an iPhone meant no photos! I’d also been out to eat for the last 6 months saying “I should start a blog…” and this finally sparked it. Turns out, the first paragraph would morph into my tagline for all “The [something] Vegans” that I would be! I started the blog thinking that no one would ever read a single word I wrote; I wrote for myself. Truly a web-log where I could keep track of the places I’d dined and work on my writing skills. Little did I know, actual humans would read it, and so would the businesses in Vegas! Managers, chefs, owners and even the PR firms would contact me after reading the reviews. I made it a point to send a link to the review every time I wrote something, and it has sure paid off. I had many invitations to try a new restaurant, or something around the corner. I frequented a few restaurants on The Strip, but mostly dined off-Strip. In 2009, just as I was leaving Vegas for Los Angeles, I received an email from someone over at The Wynn Resorts. An interesting letter detailing how Steve Wynn had gone vegan and was changing the menus in every single restaurant at the hotel to include vegetarian and vegan options. Ambitious and of course daring in a climate where most places pride themselves on over the top portions of prime rib and giant football field length buffets. 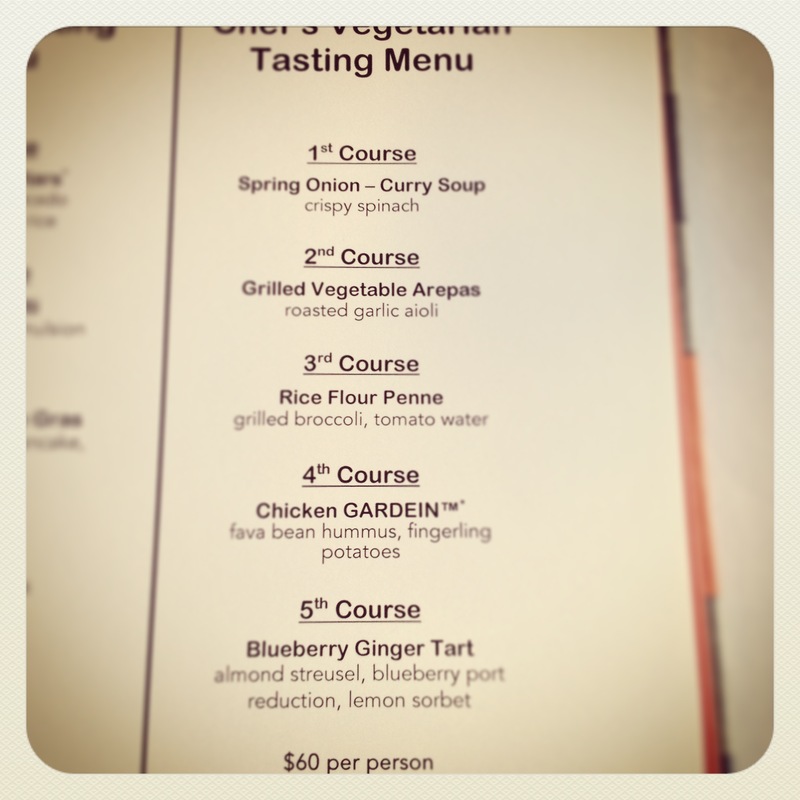 Would I be interested in coming to The Wynn to taste a few of the new menu items? I have to admit, at the time I just sort of ignored the message because I was in the middle of moving, but made a mental note that at some point in my vegan adventures, I would return to the Wynn to see what the fuss was about. 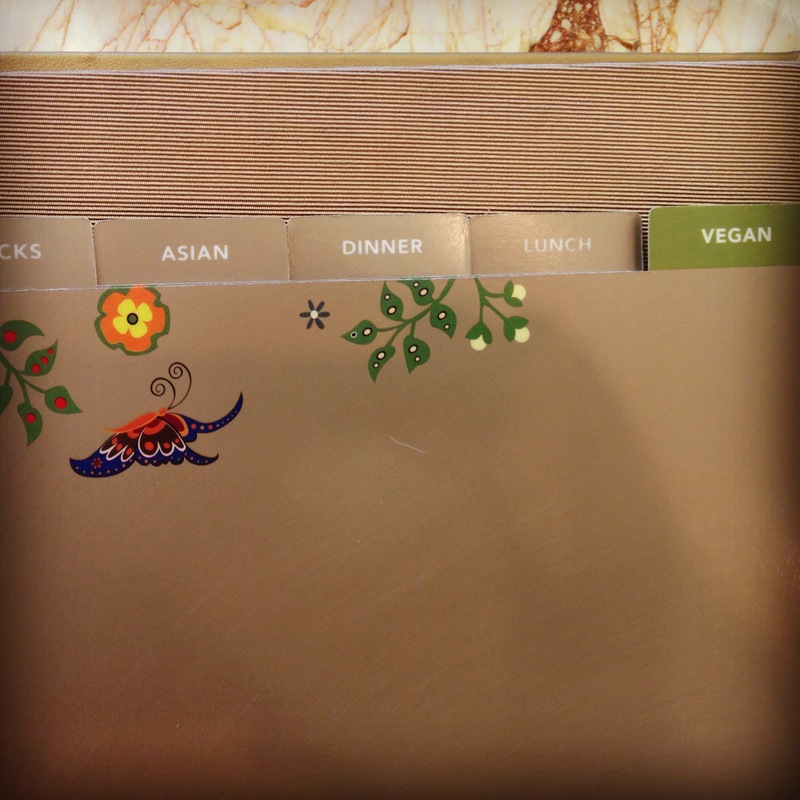 Finally, we had a chance to stay at the Wynn and sample the vegan offerings for ourselves. I have to admit, outside of Los Angeles, I’m not used to there being so many veg*n options available in one place. 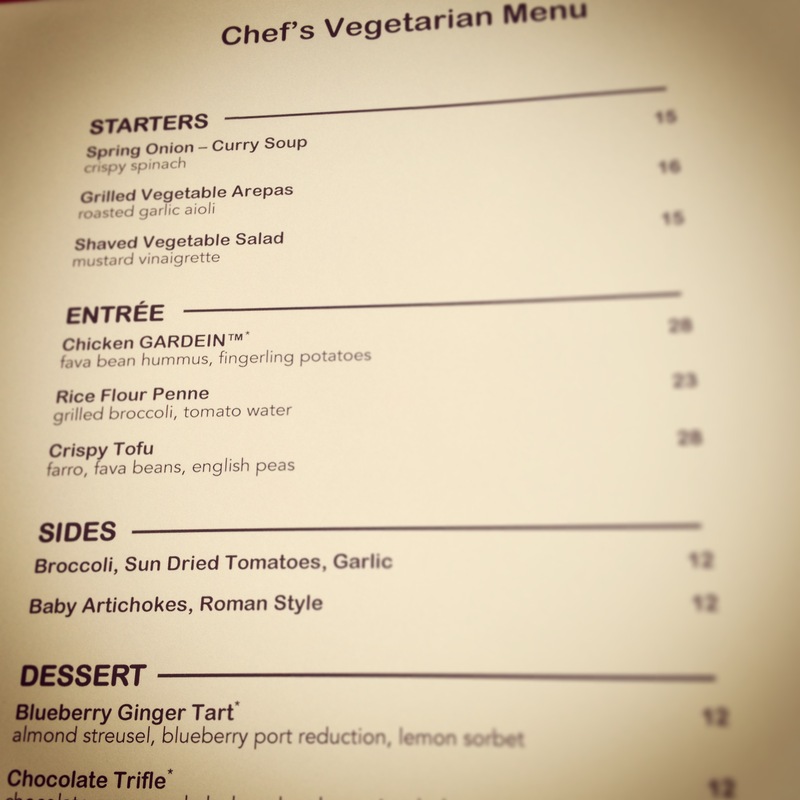 At most hotels on the Strip, you have to scan menus carefully and constantly remind your servers that “no dairy” includes butter and no, fish is not a vegetable. It’s frustrating and tedious. So the first thing I did was pick up the In-Room Dining menu… Did you see it? The little GREEN tab?! 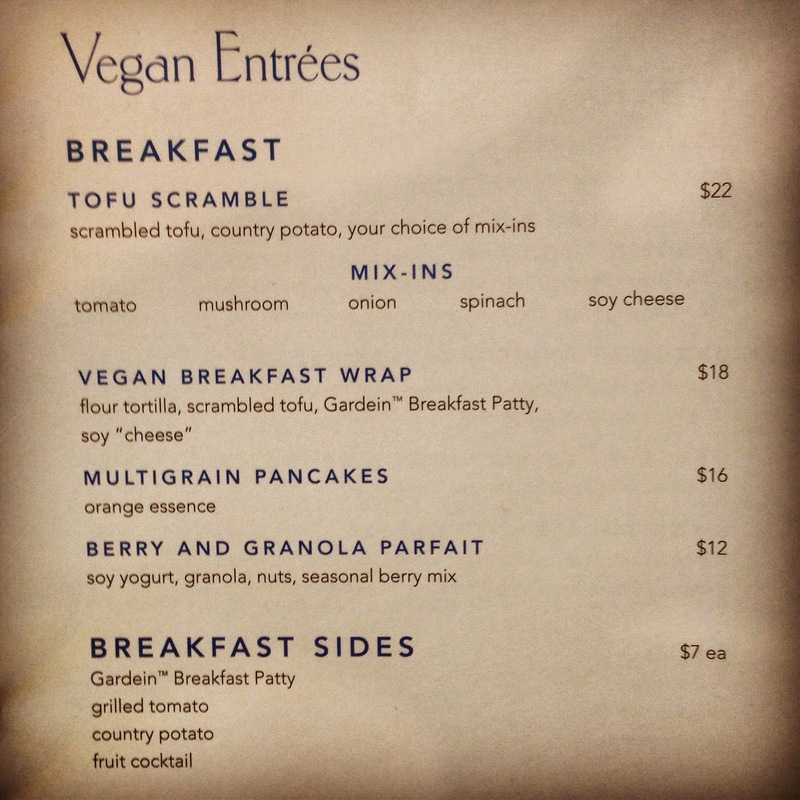 At first, I thought I was hallucinating, but there it was: a whole “vegan” section in the menu! Look at these fantastic breakfast choices! And that’s just the “Breakfast” page, there were 3 more pages: Lunch, Dinner and Snacks & Desserts. Oh yes, all kinds of yummy treats made with Gardein and whole vegetables. Let’s face it: dining out isn’t exactly the most “healthy” type of dining. It’s usually laden with salt and all kinds of fats and sugars to bump up the flavors, but when there are actual options, who cares? Of course I had the Multigrain Pancakes and a side of “country potatoes”. The best part was, when Friand was placing the order, the person on the other end asked specifically if those were the vegan potatoes or the regular. Wow, right? Now that’s what I call attention to detal. These were so delicious that I actually forgot to take a photo before I dug in… I did the best I could with what was left on my plate! 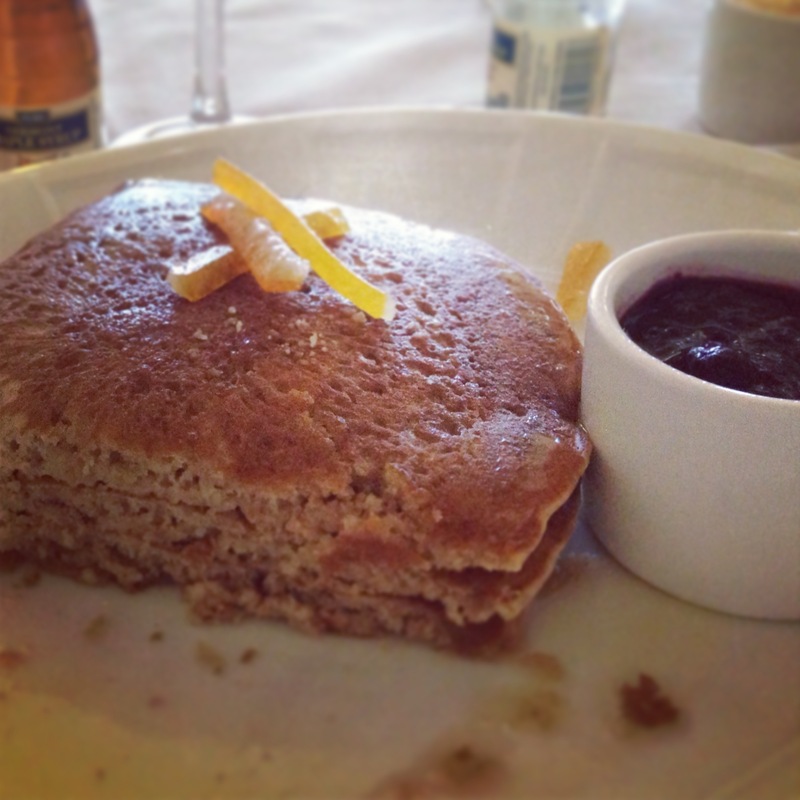 The pancakes were sweet, nutty, lightly orangy, soft, fluffy and absolutely everything you’d want from a stack of pancakes. There was a side of some sort of berry chutney, which are always too tart for me, and a topping of candied orange peel which were wonderful! The syrup was Vermont maple (now *that’s* how you win my New England heart! ), and they gave me 2 bottles so I never had to suffer a bite without syrup. The potatoes were outstanding! Basically potato cakes, almost like latkes, with shredded onion, green peppers, thyme and sage. I could easily eat 10 of these things, and don’t think I wouldn’t! I’ve really only been able to eat breakfast foods at Hugo’s, so this is literally my second vegan restaurant breakfast experience. Don’t be fooled by my post entitled “IHOP” and the fact that it’s had probably the most hits of any blog entry I’ve ever written. Quite frankly, the best part of our entire dining experience at The Wynn happened in our room with the room service menu. Even Friand enjoyed his corned beef hash from the in-room menu more than anything he had at either restaurant downstairs. My pancakes were to die for! I am dreaming of the next time we stay there – I don’t want to eat downstairs ever again, I just want to order room service for every meal and be done with it. In-Room Dining at the Wynn gets 5 very enthusiastic sprouts!! Now onto the restaurants. We did manage to make it to Mizumi, the Japanese/Sushi place. To be fair, I did not take any photos or plan on writing a review of this one. I had the Nasu Miso, which is normally one of my favorites, but here did not even make an impression. The Vegan menu is extensive for a sushi place, with the usual veggie rolls and tempuras. Really, nothing to write home about. 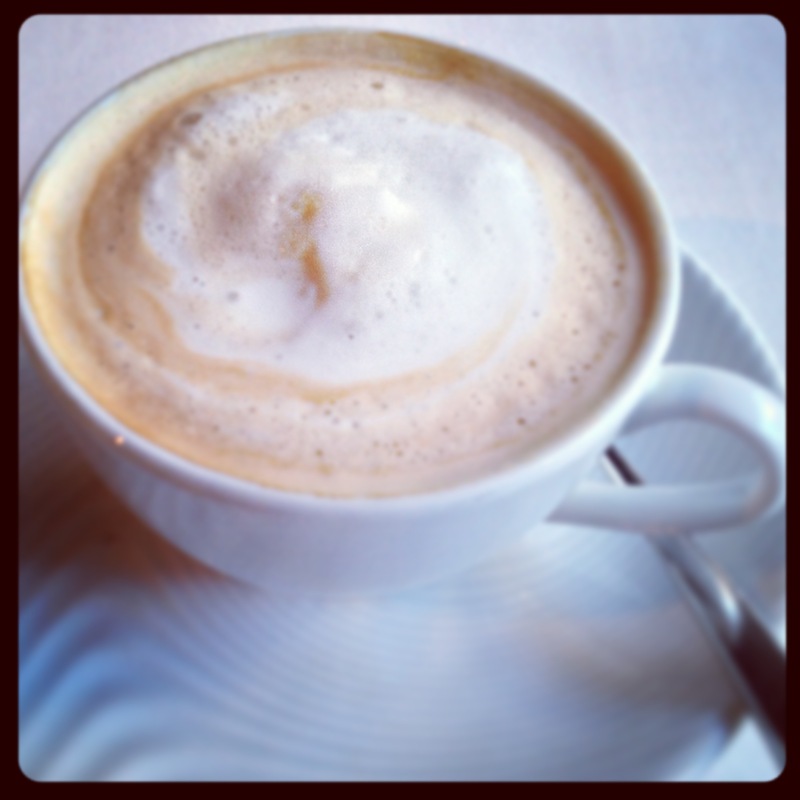 Friand did write a review on Yelp!. Surprisingly, I had a fantastic meal at Botero which is a steak house! This proves my point that a vegan can truly eat anywhere. Seriously. Casa de Carne. And it was a very good meal! Ok, Steve Wynn is vegan and I suppose he expects to be well fed at every restaurant in his whole establishment, so maybe this wasn’t so surprising. Our server arrived and we mentioned that I was vegan. No problem! He directed me right to the vegetarian menu at the back of the menu. I know, sounds like “putting Baby in the corner” kind of treatment, but considering the menu took up two whole pages, I really can’t complain! He also pointed out that although the word “vegetarian” is used, it’s actually all vegan. Apparently “Vegetarian” is a much gentler word than vegan, but whatever. We’ll all live. 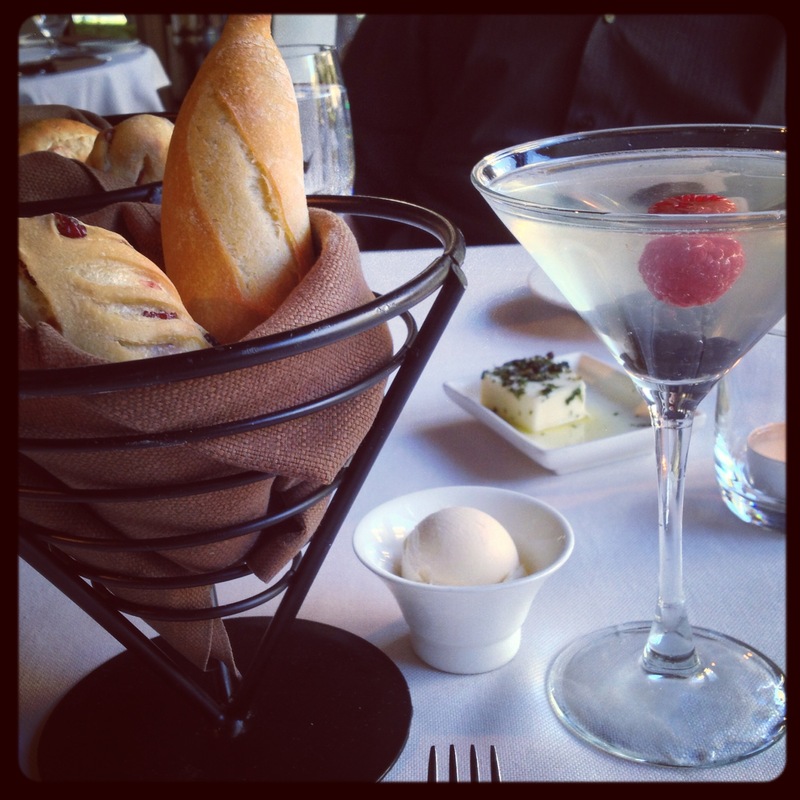 We began our meal with drinks and a bread basket. The server told me that the ciabatta and cranberry breads were both vegan, but the third offering was not. That’s fine. I was already not very hungry from a day of travel so I wasn’t going to be eating much bread. See that little ball of butter next to the bread basket? That’s “vegan” butter! If I had to take a stab, I’d say it was Earth Balance. 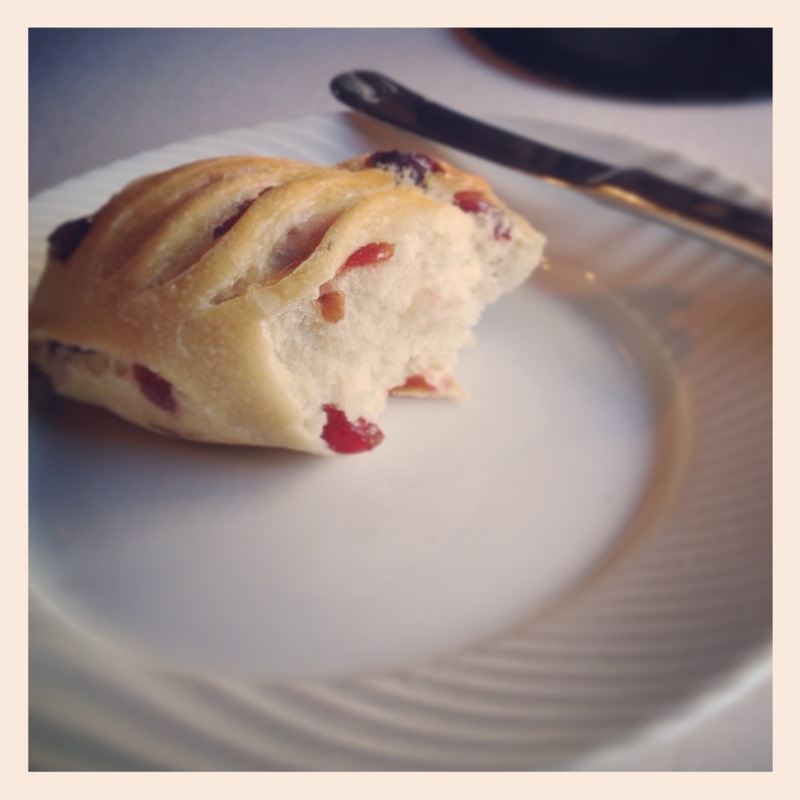 I was glad for it: it’s so rare that any sort of butter is even offered to the vegan, it was a nice compliment to the cranberry bread. As we pondered our meal options, our server then arrived with “tidbits” from the kitchen to welcome us. Wow! Really? That only happens at places where they already know us, never at a new place. But there it was: Spring Onion Curry, in a little sampler cup for me to whet my appetite. 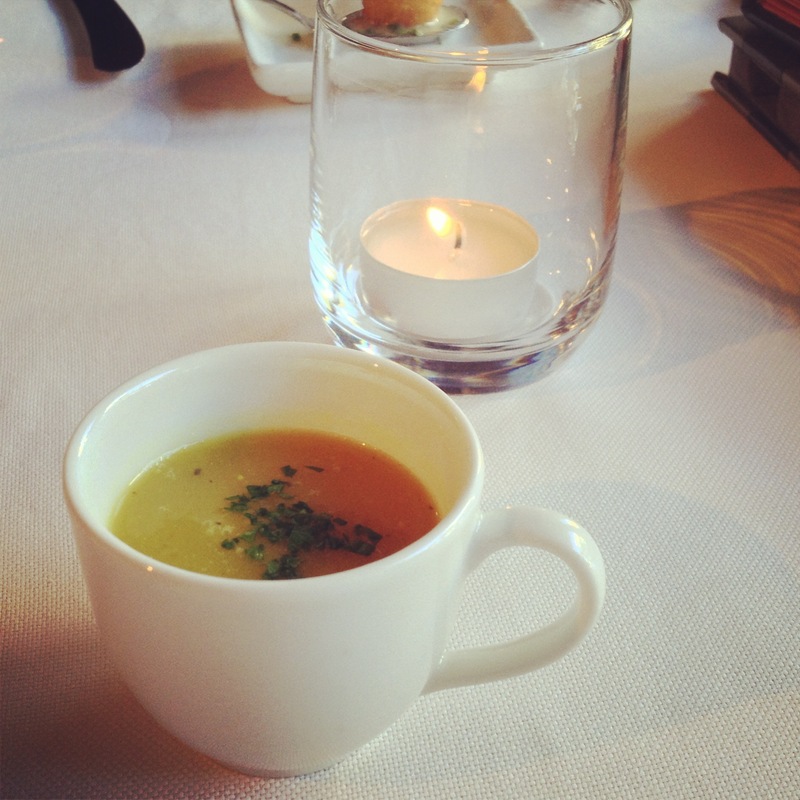 It was fantastic – sweet and only a little spicy, it was a very well balanced puree soup. I absolutely could see myself ordering a full cup or even bowl of this and eating every last piece of bread in that basket coated with it (including the cranberry bread!). This is part of the “Starters” section of the menu, so if you’re interested in a soup, totally go for it! 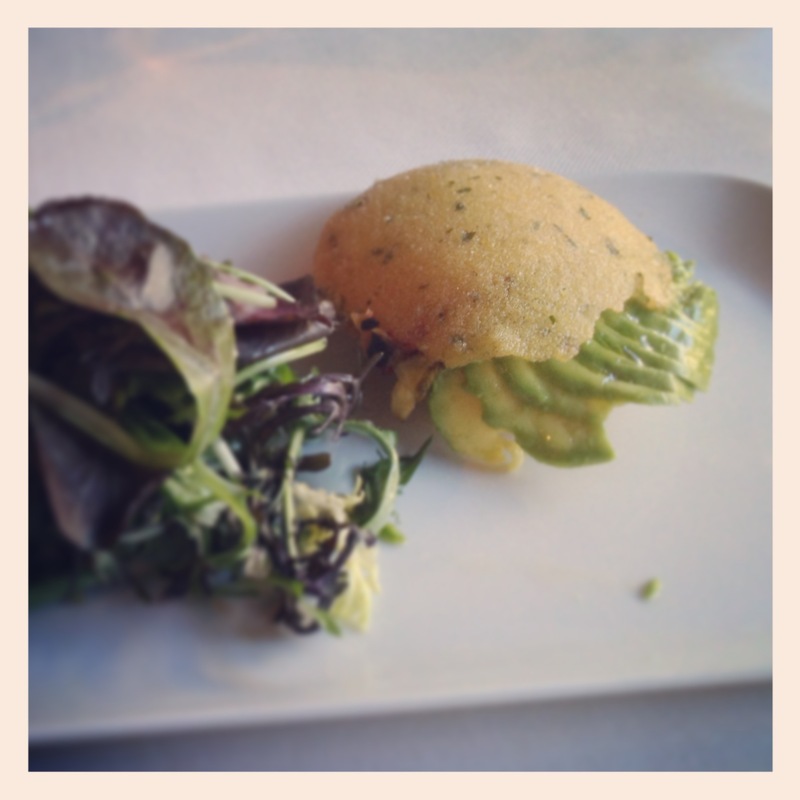 For my official starter, I ordered the Vegetable Arepas though I admit I didn’t really know what and arepa was. Turns out, it’s something deeeeee-lishus! There were two on my plate, and I really should have only eaten one. These are so rich, I would recommend sharing or making this your meal along with drinks because WOW was I filled up after eating both. They are rich and unbelievable “cheesy” and light and oily. The corn dough was so convincing in its cheesiness that I had to ask how these things were made. Apparently, this is one chef who has discovered the joy of nutritional yeast and used it in this dough. Great job, chef! Inside were, as you can see, sliced avocado which were perfectly ripe, and a whole pile of roasted veggies dabbed with an oniony veganaise dressing. I instantly regretted eating both (of course I skipped the salad…) because I was full up to here. Time for dinner, though, and I had already ordered the Crispy Tofu. Do I ever order Tofu at places? No, not really. Why did I order it? Because if a chef is really adept at flavoring vegan food, this is a bare canvass to see what he’s really made of. And what was this guy made of? Much more creative stuff than me when it comes to tofu! Two more reasons I couldn’t resist ordering this dish was the farro and fava beans. Ask me how many times I cook either one of those items. Zero times. But chef did a fantastic job! 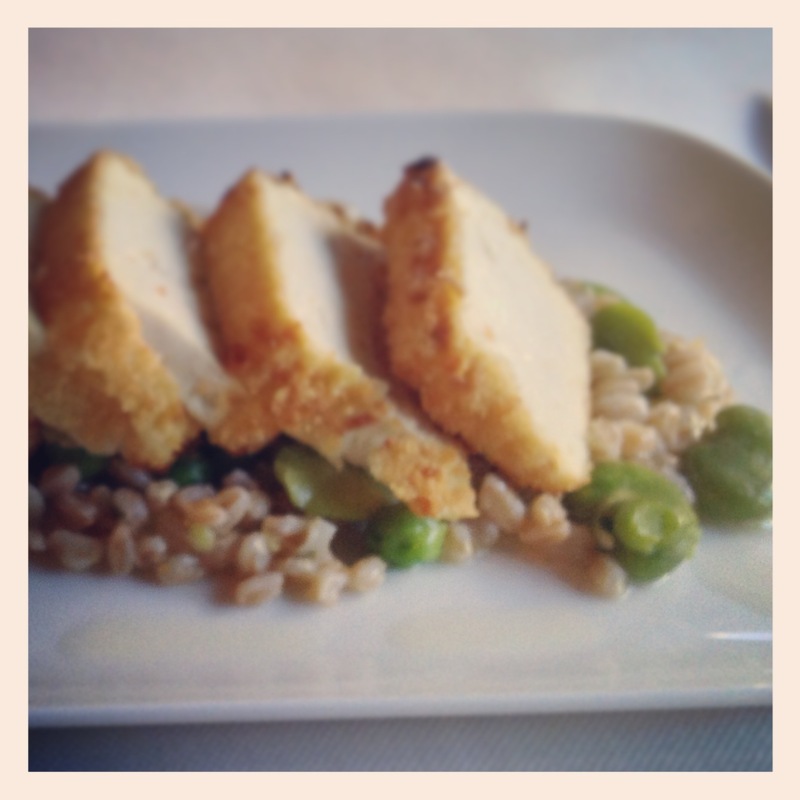 In fact, he could have made a “risotto” out of the farro, peas and fava and just tossed in cubes of coated tofu. I said as much to the server, so who knows. For my taste, it was just a tad too much tofu compared to the yumminess beneath it. I can’t forget that I was already full from the arepas, but still, it was a lot of tofu for one person! I was only able to eat about half of it, and if there was something more than a mini-bar in the room, I would have taken the rest for the next day (read: midnight snack). I cannot forget to mention the fantastic drinks that I had. With dinner, I had the Berry-Politan and Friand had the Blueberry Mojito. 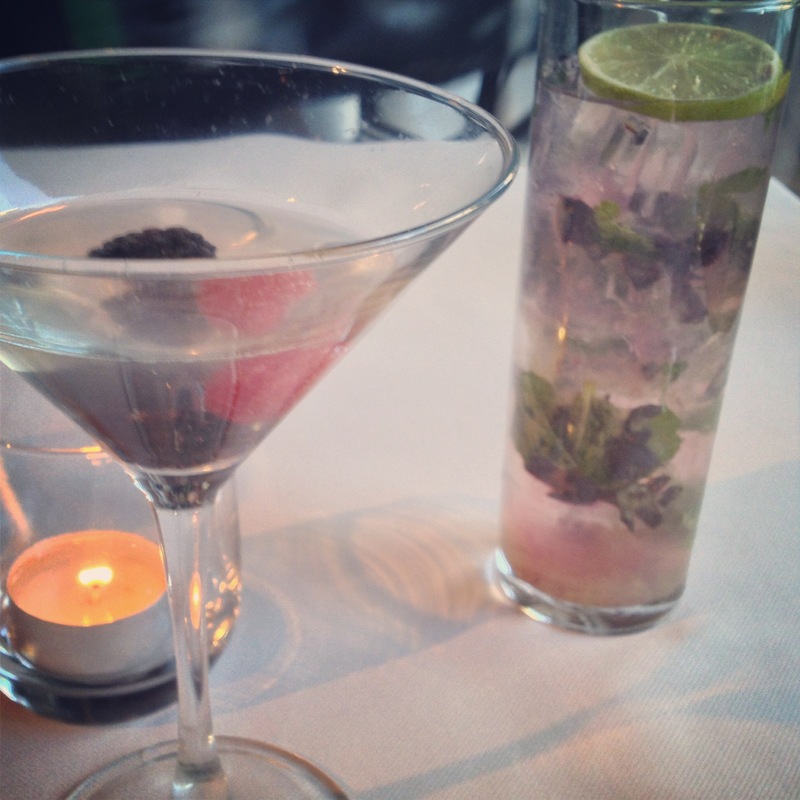 I loved my drink, it was soft & delicate, lightly berry martini-esque drink. Friand, on the other hand, said that his mojito was “a charmless, overly sweet concotion that you can only get in Vegas.” In otherwords, you should pass on the blueberry mojito. The best part of the menu is that if we decide to go back to Botero, there’s more than enough for me to try something different each time. The vegetarian menu is not listed online, though. There’s even a tasting menu, so if your stomach is as big as your eyes, go for it! I absolutely recommend Botero! You are more than welcome to “call ahead” and alert the staff that you’re vegan, but there’s really no point here. Or at any place in The Wynn. Just show up and mention to your server that you’re vegan and they’ll give you the tour of the menu. On that note, I have no second thoughts about recommending the entire Wynn to vegans. Go forth and eat fearlessly at The Wynn! 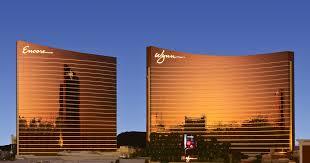 And if you needed another reason to patronize The Wynn, check out their LGBT committment! !